Quest for the perfect tiffin – and allotment update! I seem to be chasing my tail in the garden this year: despite the fact that the weather has been heaps better this year than last year, I still feel I’m way behind where I’d like to be and the allotment, half of it at least, is developing very jungly overtones! A combination of weekends away, guests at home and lots of work have taken their toll on my planting/tidying programme, so I’m having to concentrate on what’s really essential, like planting my pea seeds (mangetout Norli and sugar snap Sugar Ann). Also up there is erecting the crucial pea netting frame to stop the plumpest pigeons in the South East from decimating the crop – as has happened in previous years. I splashed out last year on one of those frames with balls at the corners in which you insert metal poles – surprisingly easy to erect, even for someone as technically challenged as me, and it withstood the worst of the wind and weather to remain standing all season – with a bumper crop! Try the Organic Gardening Catalogue if you fancy giving it a go: here. Last weekend, despite having a full house over Easter, I managed to plant my salad and herb seeds: lettuce Little Gem, Swiss chard Bright Lights, perpetual spinach, coriander, dill, spring onions, rocket and parsley. I also sowed my root crops – carrot, beetroot, parsnips and swede under their protective layer of enviromesh – which has been in situ for a few weeks now to warm up the soil. I then leave it in place to protect the carrots from the dreaded root fly – seems to have been pretty effective the last few years. This year I’ve had dreadful germination of the sweet peas I sowed at the beginning of March in the propagator in my conservatory at home: Fragrantissima from Thompson & Morgan– I’ve had this variety for years, but never had such poor germination before! I decided to sow the replacement packet straight into the ground, but I’ve planted the 9 healthy little plants I did get to germinate round the tripod too. I’m sure the later sowing will soon catch up as the weather gets warmer. Still on the to-do list are mowing the paths around and through the allotment – I like to leave the grass long to encourage insect life and wild flowers under my apple and plum trees, but cut a grid pattern of paths between the trees. Unfortunately, I haven’t had any time to mow yet, so am hoping the forthcoming Bank holiday weekend will give me chance to catch up! Compost distribution and reconstruction of the pallet compost bins are also still on the list, as is weeding the knee-high weed patch that was supposed to be home to my main crop potatoes before I relinquish that part of the plot at the end of the year. I’ve a sneaking suspicion I won’t get round to it at all – it certainly looks a very daunting prospect: scary how soon the weeds take over if you don’t keep on top of them, and all the more reason to opt for raised beds as they are so much easier to maintain! Melt the butter, chocolate and syrup in a large bowl over a pan of simmering water, stirring occasionally until combined. Remove from the heat and mix in the crushed digestive biscuits, fruit (chopped if large like apricots), seeds and nuts. Stir, then tip into a foil-lined tin. The original recipe uses a loaf tin, but I prefer to use a flat 7” by 11” baking tin. Pack down well (it will be extremely thick!) and smooth the top down. Cover with clingfilm and refrigerate overnight until set. Turn out and cut into squares. Could also add mini marshmallows or crumbled meringue instead of some of the fruit and nuts for a rocky road variation. Managed another three hours up at the allotment this afternoon – thought I might not do when I saw the rain this morning, but it eased off, and was mostly dry. 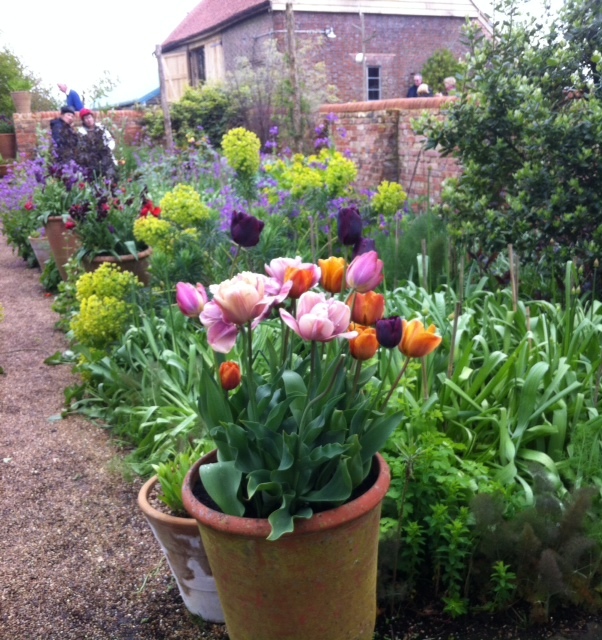 Thank goodness – still lots to do after missing a weekend last week, so good to tick off more start-of-season tasks. I planted my onion sets – I don’t grow many as they’re cheap enough in the shops all year round and onions aren’t that different when they’re home-grown in terms of taste, but I do like to have some late summer just so I can claim to be completely self-sufficient for at least part of the year! I like the mixed bags of red, white and brown onion sets from Thompson & Morgan – they seem to do well in my raised beds. I plant them as an edging around my leeks so I can rotate them with other alliums and hopefully avoid onion rot. My first potatoes went in too – I’m growing Maris Peer this year, again from Thompson & Morgan, supposedly for its delicious taste and waxy flesh. We shall see! I’ve been disappointed with the new potatoes in recent years: last year I grew Casablanca which was nothing special and the year before International Kidney, the so-called Jersey variety, but it didn’t live up to its reputation on my soil. The nicest I’ve grown in recent years was Ulster Sceptre, which I thought had been discontinued but have just checked only to see that it is still available as a special collection on the T&M site – rats! It certainly wasn’t listed in the catalogue – that will teach me not to double-check online! Another job was to water in the nematodes I thought I’d try for slug control this year. I ordered a pack of the Nemaslug with my seed order from The Organic Gardening Catalogue (I think it brought my order in for the free postage if you spent a certain amount! ), and it arrived a week or so ago. The soil has to be warm enough before you apply it as the nematodes are living organisms and will die if the soil is too cold. This morning’s rain was ideal to moisten the soil first and you just have to dissolve the pack contents, looking for all the world like sawdust, split into 4 equal amounts in four 2-gallon watering cans and water over those beds you want to protect. I chose my hostas at home – fed up with the lace curtain effect after the slugs have chomped their way through my beautiful plants on our heavy clay soil. Strangely enough, the hostas were never touched when we lived in Scotland – though they certainly had other targets up there! Up at the allotments, I watered it around my dahlia bed, the strawberries, the potatoes I’d just planted, and my asparagus bed, which also has dahlias at each corner. Watch this space – it will be interesting to see whether I notice a difference. Other jobs included putting supports – posts and wires – in for the raspberries I moved two weeks ago, general weeding and spraying Roundup over the invading hordes of buttercups and couch grass on my bark paths between the raised beds. I do try to be organic, but I reckon it’s acceptable to be a little less green on the paths…. I had hoped to plant some salad seeds – ideal time for leafy crops with a waxing moon, if you believe in lunar planting! – but with the inevitable chit-chat with fellow plotholders, ran out of time – hopefully I’ll have time to do that as part of an evening dog walk during the week. I’d planted my tomato seeds – Sungold, Gardener’s Delight and Tigerella – in the propagator at home yesterday, along with some cucumber seeds, and some basil and more parsley. I daren’t do them any earlier as with no greenhouse, they can’t go outside too soon anyway. A thoroughly enjoyable few hours’ work – and a satisfying basket of golden chard, spinach, rhubarb, purple-sprouting broccoli, leeks, swede and parsnips to bring home – who said anything about the hungry gap?! 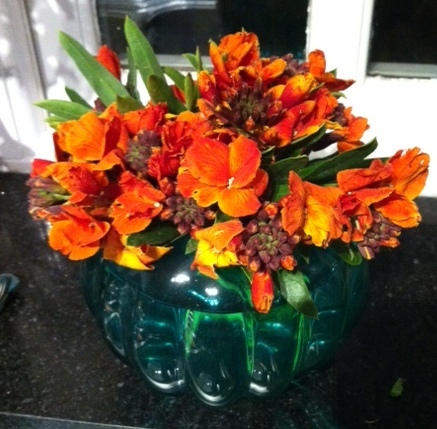 Oh and a lovely bunch of deep orange wallflowers too, which now look stunning in a turquoise glass vase on my kitchen windowsill. 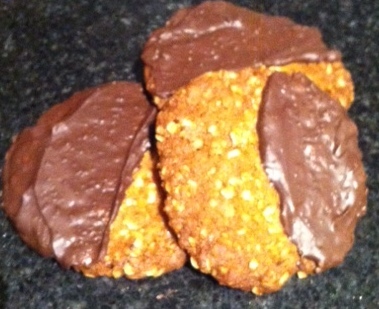 This weekend’s recipe is for some cookies I conjured up this morning whilst waiting for the rain to stop. Delicious, if I say so myself! Mix the sifted flour, sugar, oats and bicarbonate of soda in a large bowl. Melt the butter and syrup in a pan, then stir into oat mix and add half the orange rind. Divide into small truffle-sized balls (I got 19) and place well apart on two greased baking trays, flattening slightly with the heel of your hand. Cook for 15 minutes at 160°C fan (Gas 4) until golden brown. Cool slightly on the trays, then transfer onto cooling rack to cool completely. When cool, melt the chocolate and the remaining orange rind in the microwave (short bursts and stirring help prevent burning). The orange rind leaves the chocolate slightly bitty in appearance, which doesn’t bother me, but if you’d rather have it smooth, you could try orange oil (extract) instead. Spread chocolate onto the bottom half of each biscuit with a small spatula and leave to set before serving.